Bolivia’s Carlos Keller defends his PARC singles title. We’ve finished the 32nd annual PARC event, held by International Racquetball Federation – IRF / International Racquetball Federation in Barranquilla, Colombia. www.internationalracquetball.com for the full results. – Team Combined: Mexico, Bolivia, USA, Argentina. – This is Bolivia’s first ever Team competition win. – This was also Mexico’s 10th straight Women’s team PARC title. – Ecuador’s long-time veteran Fernando Rios eliminated Costa Rican IRT touring vet Felipe Camacho in two close games 14,12. – Guatemala’s Juan Salvatierra took out Colombia’s Andres Gomez by the closest of margins; 14,14. – #5 seed Bolivian number one Luis Conrrado Moscoso Serrudo took out Canadian number one Samuel Murray by the dominant scores of 6,6. Murray, who sits ranked 7th on the International Racquetball Tour, previously topped Moscoso when they met at the 2018 US Open, and I expected a tough match here. I did not expect Murray to fall 6 and 6. An early statement win here for Moscoso. – #3 seed Mexican Alvaro Beltran came from a game down to top #14 seed Colombian Mario Mercado in this battle of IRT top-10 touring pros. – #6 Dominican Republic number one Luis Perez took a hard-fought match against Ecuadorian veteran Jose Daniel Ugalde Albornoz to advance. – #7 Carlos Keller Vargas played a tough match against Canadian Coby Iwaasa and advanced in two straight 10,9. These results ensured a perfect chalk round of 16, with all top 8 seeds advancing. Two each from Mexico, Bolivia, USA, then the #1s from Costa Rica and Dominican Republic comprise your quarters. in the Quarters though … huge upsets. – #1 Mexican Alejandro Alex Landa can’t convert on match point and loses in the tiebreaker to #8 Acuna (6),14,7. A great win for the solid Acuna, who avenges a loss to Landa in the Semis of the 2017 PARC. – #4 American Charlie Pratt came back from 1-8 down in the tiebreaker to shock the Bolivian Open champ #5 seed Conrrado Moscoso 11-10. I had predicted Moscoso would win this event, but Pratt found a way (as he usually does) to peck away at Moscoso’s game, kept his focus, used some excellent serving and kept forcing Moscoso to make that one additional shot and came out on top. – #3 Beltran eased past #6 Perez 9,6 in a match that probably wasn’t as close as it seemed; the match was tied 8-8 early, then Beltran ran away with the first and continued dominating the second to advance. – #7 Keller took a solid 12,10 win over #2 seed American David Bobby David Horn. The defending champ scores the “upset” by seeding but beats Horn in a rematch of last year’s PARC final. – Pratt won a back and forth close match against Acuna to advance to the final. Both players play a very similar game, more tactical than explosive, more cerebral than showy, and Pratt outlasted Acuna to return to his third major international Men’s singles final in his 3rd IRF appearance. In the Final, Keller avenged a loss to Pratt in the 2017 PARC to win the final and defend his title. Pratt loses in the final for the third time in three international appearances. – After struggling in the RR phase (apparently due to illness), Argentinian #24 seed Natalia Mendez Erlwein dominated #8 Bolivian Angelica Barrios 3,11 to advance. Mendez really pushed the game and took Barrios out of her game early on. – #12 seed Maria Jose Vargas Parada obliterated #5 seed Guatemalan Maria Renee Rodríguez 2,0. – #13 seed Rhonda Rajsich got a solid win over #4 seed Chilean Carla Muñoz Montesinos 10,14 to keep her 3-peat dreams alive. – #6 Bolivian Valeria Centellas got a solid win over American Kelani Lawrence 7,8. Its hard to emphasize this enough … but Centellas is only 17. She’s got two years remaining in juniors and is making the back end of Adult major international championships (and, it should be noted, was the #1 Bolivian here, ahead of Barrios and presumably ahead of Sabja unless she didn’t compete in the singles qualification ahead of this event). – #15 Ecuadorian Maria Paz Munoz pulled off the biggest upset of the event though, topping #2 Colombian and home-town favorite Amaya Cris 11-8 in a tie-breaker. Great win for Munoz. So that’s Two from Mexico, two from Argentina, and one each from USA, Bolivia, Dominican Republic and Ecuador into the quarters. – Mendez continued her great run, downing the #1 seeded Mexican Monste Montse Mejia 13,13. This may be the best win of Mendez’ career and it comes after an 0-3 showing in the group stage. – Vargas trounced the hobbled Rajsich 4,8. – #3 seeded Paola Longoria dropped a game to the Bolivian 17yr old Centellas before rebounding and advancing. – Maria Paz Munoz ran away in the tiebreaker after two close games against Dominican #7 seed Merrynanyelly Delgado to advance to the semis. So that’s the #24, #12, #3 and #15 seeds into the PARC19 semis. In the semis, no real surprises as Vargas outlasted her countryman Mendez for the second time this year, while Longoria dominated the Ecuadorian Maria Paz Munoz in two. In the final, Longoria downed Vargas for the 32nd time in 33 career meetings to secure her 8th PARC title. Men’s Doubles: After vanquishing the #1 Mexican team, the Bolivian team of Moscoso and Roland Keller got their second big title in as many months and their first international major title together by coming back from a first game embarrassment to top the Canadian pair of Murray & Iwaasa in a tiebreaker. Women’s Doubles: Longoria and Samantha Salas proved again why they’re the best doubles team in the world, never giving up more than 9 points in any single game en route to a dominant finals win over the host country team of Amaya & Riveros. With the win, the pair secured their 13th international doubles title together. Congrats on a great tourney, look forward to the rest of the IRT and LPRTtours the rest of the way. Mejia is the #1 women’s seed heading into the knockouts. 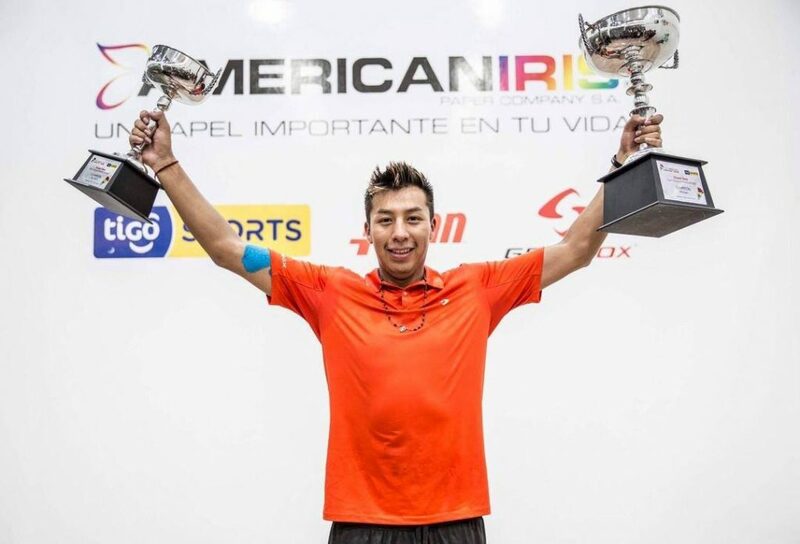 We’re through the round robin/group stages of the 32nd annual Pan American Racquetball Championships; lets review the interesting and upset results from the singles RRs and then preview the knockouts. A reminder; the results are re-seeded after the group stages for the knockouts. – #4 seed Charlie Pratt took out #13 Mario Mercado in his home country in an 11-7 tiebreaker. – #3 seed Alvaro Beltran saved match point against versus Chilean journeyman Francisco Troncoso before finishing off a tie-breaker win. 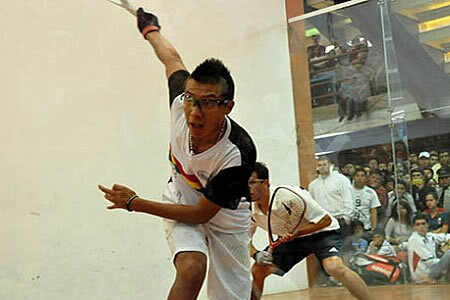 – #8 seed Canadian Coby Iwaasa was upset in the RR stage by Costa Rican #1 Andres Andres Acuña 8,7. Acuna took out Horn in the 2018 US Open and has made the quarters or better of the last three PARCs, so this is no fluke. – Dominican #1 Luiz Perez lost 11-10 to unknown Venezuelan Roberto Leyes … but then took out two IRT veterans in Felipe Camacho and top-8 player Samuel Murray to win his group. This is not the first time Perez has made noise in IRF events: he’s got wins over Acuna and Montoya in 2018 and now gets a seed in the knockouts. – #1 Montse Mejia was stretched to a tie-breaker by long-time IRF Ecuadorian vet Maria Paz Munoz. – #13 Amaya Cris scored the biggest RR upset, taking out #2 Rhonda Rajsich in a close tie-breaker 14,(14),8. Amaya is the home-court favorite here and has now put herself in a great position to advance deep. – #3 Paola Longoria outlasted Maria Jose Vargas Parada 12,13. Vargas’ sole career win over Longoria was at this event in 2018 but could not repeat the feat. – #5 Maria Renee Rodríguez played a solid game to beat Natalia Mendez Erlwein and remain the favorite to advance as the seeded player out of the group. Mendez then lost to long-time Venezuelan player Mariana Tobon before defaulting the last match of the group. – The 16/17 match between Cuban #1 Maikel Mollet and Chilean #1 Francisco Troncoso should be close. – Ecuadorian #1 and #9 seed Fernando Rios gets a tough test against Costa Rican veteran Felipe Camacho. Could go either way. – #10 Coby Iwaasa gets an interesting match against long time Argentinian veteran Diana-Shai Manzuri, who has been representing Argentina in international events for more than 20 years now. – If Camacho can take out Rios, he likely faces his country-man Andres Acuna, who beat Camacho on the IRT twice in 2018. – #5 Luis Conrrado Moscoso Serrudo vs #12 Samuel Murray: a brutal round of 16 here; these two met at the 2018 US Open and Murray topped Moscoso in a tie-breaker. So Murray can beat the newly crowned Bolivian champ. What to make of Murray’s upset in the RRs? This is a hard one to predict but the winner could go pretty far. I think i’ll go with the hot-hand Moscoso here. – #14 Mario Mercado vs #3 Alvaro Beltran; another tough draw for a seeded player; Beltran has to face Mercado on his home soil. Beltran beat Mercado handily in Chicago in March … but Mercado played lights out at the Bolivian Open in making the semis. I think this is close and Beltran ekes it out. – #7 Carlos Keller Vargas, your defending champ, faces a tough out in Canadian Coby Iwaasa in the 16s. I think Keller advances, but Iwaasa makes it hard on him. – #1 Alejandro Landa over #8 Acuna: this is a rematch of the 2017 PARC semis, a 2 game close win for Landa. They also met at the 2018 Florida IRT championship. Landa prevails. – #5 Moscoso over #4 Pratt: Moscoso’s firepower overcomes Pratt’s tactical game. – #3 Beltran takes out the upstart Dominican #6 Perez. – #7 Keller over #2 David Horn; this is a rematch of the final of last year’s event, a tie-breaker win for Keller. I’m going to predict it happens again. – #5 Moscoso over #1 Landa; they met in Bolivia, in the semis of that Grand Slam … and Moscoso won in an epic donut tie-breaker. I think we see a similarly close game this time around with the same result. – #7 Keller over #3 Beltran: they met in the quarters of the 2015 PARC and Keller got him then. I think Keller can do it again. Final: an all-Bolivian final, with #1 over #2 as Moscoso downs his countryman for the title. If it happens this way, Moscoso will have more than earned t his win. – #9 Cuban Maria Regla Viera gets to play the 24th seeded Natalia Mendez; is Mendez hurt? Why did she default her final RR match? Either way, the LPRT top 10 player has a tough one against a tough Cuban. – #12 Vargas gets the precocious Costa Rican Maricruz Ortiz. Ortiz was the losing finalist to Centellas at world 16U juniors in 2018 but is already representing her country at the Adult level. – #15 Maria Paz Munoz gets a tough match against the other Cuban in the draw, Yurisleidis Alluie. Munoz should advance but as we’ve seen, the unknown Cuban competitors can make waves. – #8 Angelica Barrios faces off against the Mendez/Regla Viera winner, in what could be a pretty good match. Either way, I like the Bolivian junior to advance. – Vargas vs #5 Maria Renee Rodriguez; a tough draw for Rodriguez, who wins her group and earns the bye but gets current top 4 LPRT player Vargas for her troubles. – #4 Carla Carla Muñoz Montesinos vs Rajsich; tough break for Munoz, who wins her group and then gets the two-time defending PARC champion. – #6 Valeria Centellas vs #11 Kelani Lawrence; this could be a good match-up. I think Lawrence could pull the upset-by-seed here over the reigning 16U world junior champ. – #1 Montse Mejia vs #8 Barrios: they met in the 18U world juniors semis in both 2017 and 2018; both Mejia wins. I think Mejia continues her run. – #12 Vargas vs #13 Rajsich: they’ve met 29 times across all competitions and are just about dead even; Rajsich currently leads h2h 15-14, and has won their last two meetings. But Rajsich was struggling in Bolivia with a knee issue; is she recovered? I’m going with Vargas here to ensure a new PARC champion. – #3 Longoria over #11 Lawrence: Longoria has something to prove here, having lost to Mejia at Mexican Nats and having been the losing finalist the last two tournaments. She outclasses Lawrence here, looking for more. – #2 Amaya takes out #7 Delgado on home soil. – Vargas over Mejia: they’ve only met once; in April 2018 on the LPRT, a 3 game dominant Vargas win, and even thought Mejia has really stepped up on the world stage lately, Vargas has been on fire. – Longoria over Amaya: they’ve met 12 times across LPRT and IRF and Amaya has never won. I don’t think she breaks that duck here. Final: Longoria over Vargas. Longoria has owned Vargas in their careers (30-1 in 31 matches in LPRT and IRF). If Mejia takes out Vargas… then this is a whole new ball game. Mejia’s solid win over Longoria on home soil was a big step up in the world and a Longoria/Mejia final would be pretty compelling to watch. Longoria is basically unbeatable in the pro format, but has taken losses here and there over the past few years in the amateur format; can it happen again here? Men’s doubles thoughts: no real surprises in the RR sections, as the pre-tourney 1,2,4 and 6 seeds won their group. I think the knockout draw is top-heavy, with the semis featuring the two best teams (that being the Mexican team of Rodrigo Montoya Solís & Javier Mar and the Bolivian team of Moscoso and Roland Keller). The Bolivians fell to the Mexican teams at both the 2018 PARCs and Worlds, albeit with different players. I think the same happens here, despite Moscoso & Keller coming off of the Bolivian slam win. I think the Canadians (Murray & Iwaasa) take out the American team of Jake Bredenbeck and Mauro Mauro Daniel Rojas in the quarters, on the bottom half, then get past the Costa Rican team of Acuna/Camacho before losing to the Mexican pair in the final. I think the Mexicans down the Bolivians in one semi, then take out the home-town Colombian pair of Riveros and Amaya for the title. Follow @IRF on Facebook to get Tim Timothy Baghurst calling all the streaming matches. Landa is the #1 Men’s seed. 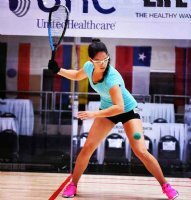 visit www.internationalracquetball.com to follow along Mens and Womens, Singles and Doubles draws. Follow the IRF on facebook for live streaming as Tim Baghurst has flown down to the tourney to provide streaming commentary all week. The time has come for the first big International Racquetball Federationevent of 2019; the 32nd annual Pan American Racquetball Championships (PARC). This event was first held in 1986 in San Jose, Costa Rica and was initially known as the “Tournament of the Americas.” The initial tournament results have been lost to the wind as we can find no records for it. But, nearly every year since the tourney has moved around North and South America. The tournament skipped a couple of years when Racquetball was included into the Pan Am Games (but, not this year), and skipped one year in 2000 when civil unrest in the host country rose up, but otherwise has been an annual event that has done a great job of introducing top players to the scene who don’t normally travel to the states to play domestic IRT events. Women’s #1 Paola Longoria has 7 career PARC titles … but has lost to long-time rival Rhonda Rajsich a few times in this event (including the last two finals). The Men’s singles draw has been an interesting competition over the years, with 9 different players winning the last 10 titles. There’s plenty of opportunity this year, with 3 past champions in the men’s draw plus both the losing American finalists in the last two iterations. The competition features days of round robins that are seeded, then the competition is re-seeded for the knockouts. Players are seeded not by individual accomplishment but by past country performance. 1. Alejandro Alex Landa; the reigning Mexican champ and 2017 PARC winner. 4. 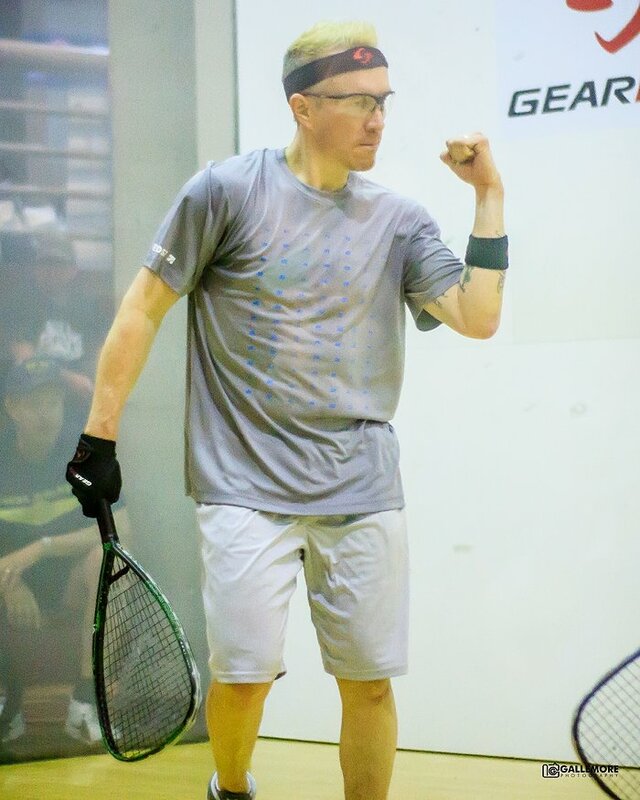 Charlie Pratt, who made the semis of 2018 USA Nationals and the finals of the qualifier held at national doubles earlier this year to earn his spot. Pratt’s seeding has been done no favors as he has current IRT top 10 pro Mario Mercado in his round robin grouping, seeded 13th here. 5. Luis Conrrado Moscoso Serrudo is seeded 5th as Bolivia’s #1 player; Moscoso just won the Bolivian Open Grand Slam and beat a couple of the players seeded above him here and is clearly a threat to win his first major international title. 6. Samuel Murray is seeded 6th as the clear #1 Canadian male, having swept Canadian qualifiers leading up to this event. 7. Carlos Keller is seeded 7th; he’s Bolivia’s #2 but is also the reigning champion of this event, having beaten Horn in the 2018 final. 8. Canadian Coby Iwaasa is the 8th seed; he was the losing finalist to Murray in the last three major Canadian singles events. We won’t do predictions until the knockout draw is announced … but if these seeds hold we stand to have some really good quarter final matches throughout. 1. Montse Mejia, who upset Paola Longoria to take the Mexican Nationals in February and is thus the #1 overall seed. She’s also the reigning 18U junior world champ and could make a statement in this event. Mejia gets LPRT touring vet Adriana Riveros in the group stage. 2. Rhonda Rajsich, still reigning as the USA #1 having won the qualifier and the 2018 US nationals events. Rajsich has Colombian #1 Amaya Cris to deal with in her RR group. 3. Paola Longoria, a 7-time winner here but entering as the Mexican #2 due to her loss to Mejia at Mexican Nats earlier this year. Paola heads up against Maria Jose Vargas (an under-seeded #12 here despite being top 4 on the LPRT and having just won the Bolivian grand slam) right out of the gate. 4. Kelani Lawrence, my fellow Virginian and now unquestioned USA #2 having been a losing finalist to Rajsich in three straight USA qualifying events. She faces a tough RR draw, with Chilean #1 and LPRT top pro Carla Carla Muñoz Montesinos in her draw. 5. Maria Renee Rodríguez slips into the #5 seed thanks to the recent and sudden retirement of former Guatemalan #1 and reigning World Champ Gaby Martinez. For her troubles, she gets LPRT top 10 player Natalia Mendez right out of the gate. 6. Bolivian Junior Valeria Centellas is the 6th seed. She’s the reigning 16U junior champ and was an 11-9 5th game tiebreaker loser at the Bolivian grand slam to eventual titlist Vargas. She has a manageable group though, with her toughest match coming against Canadian #1 Michele Morrissette. 7. Marie Gomar slides into the #7 seed as the Guatemalan #2, and gets #8 seeded Bolivian junior phenom Angelica Barrios right out of the gate. Barrios made the semis of the Bolivian Grand Slam, knocking out two top-10 LPRT players, and can make a deep run here. Thanks to a really international feel on the LPRT, nearly all the RR groups feature LPRT regulars going at it, and we should see some upsets by seeds before the knockout brackets are set. In doubles…there’s 15 Men’s teams competing and there’s probably 5-6 Men’s teams who think they can win this thing, including the reigning Mexican champs Rodrigo Montoya Solís and Javier Mar, plus the just-crowned Bolivian grand slam champs of Moscoso and Roland Keller. On the women’s side, the dominant Mexican team of Longoria & Samantha Salas Solis are the favorites. we’ll talk more about doubles once the knock out draws are set. Scott denies Munoz a 4th straight title. 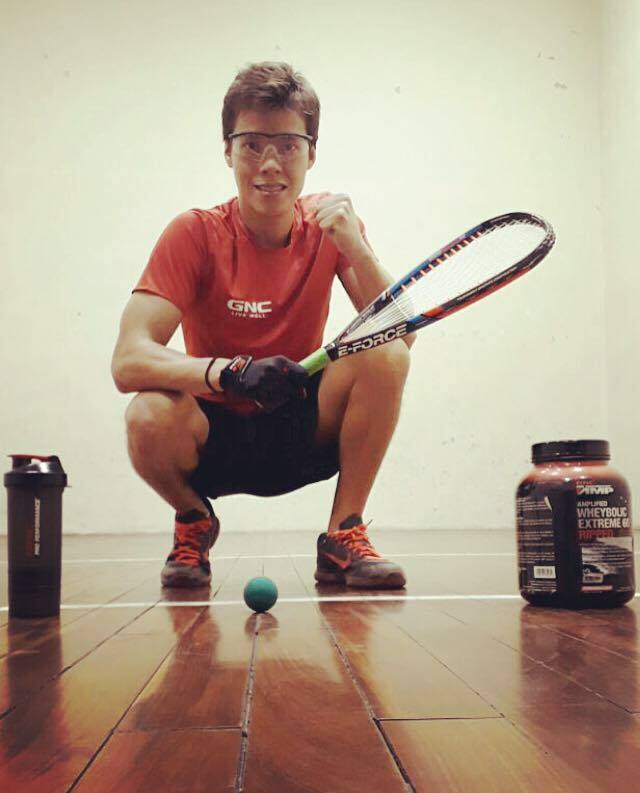 Here’s a wrap-up of this past weekend’s USA Racquetball Intercollegiate championships, held at Arizona State University in Tempe. A reminder: we don’t load this data into the database at current, but we do keep track of past champions for informational purposes. At the bottom i’ve got some school-based factoids including the 2019 champs. On the Men’s Singles #1 side, a couple of upsets in the 16s but the top 6 seeds all advanced. In the quarters, only one upset with #5 Jacob Matthews of ECU taking out 4th seeded Nick Buring of Oregon State. In the semis…both top seeds advanced with ease, with #1 Erik Garcia of CSU-Pueblo topping #5 Matthews 3,7 and #2 Alejandro Almada from Texas topping #3 seed Jeremy Dixon from Baldwin-Wallace 2,5 to setup the anticipated final. In the final, #1 Garcia downed #2 Almada in a tiebreaker to win the title. Garcia repeats as champion, becoming just the 10th male to hold more than one intercollegiate title. On the Women’s side, the top 8 seeds all advanced to the quarters. There, similarly to the Men’s side just one upset in the #5/#4 match with Costa Rican international Melania Mela Sauma Masis (playing at her home courts at ASU) topping 4th seeded Lexi York from Oregon State in a tiebreaker. In the semis, #1 seed Carla Muñoz Montesinos of CSU-Pueblo knocked out Sauma in two games, while #3 seeded Hollie Scott (playing out U of Washington), continued her solid form lately and topped 2nd seeded (and my pre-tourney pick) Erika Manilla from N. Arizona in dominant fashion 9,4. In the final…Scott dominated Munoz for the win 2,8 to deny Munoz a chance at 4 straight intercollegiate titles. – Mens doubles went to Garcia/Le from CSU-Pueblo, who downed the Texas pair of Almada and his partner Jerry Yang. – Women’s doubles went to the CSU-Pueblo team of Riveros/Laime, who downed OSU’s York & Natalie Lorati in the final. – Garcia’s Men’s #1 win represents the 8th Men’s #1 title for players from CSU-Pueblo (formerly known as the University of Southern Colorado). They still trail University of Memphis (formerly Memphis State University) which had 12 Men’s #1 winners in their history. – Half of the now 47 Men’s #1 intercollegiate title winners have come from just three schools: Memphis, CSU-Pueblo and Southwest Missouri state. – Tim Sweeney remains the sole player in history to win four consecutive intercollegiate titles, a feat Munoz was attempting to match. – Scott’s victory for University of Washington represents the 25th distinct college to provide a #1 women’s winner. Memphis remains the #1 school for Women as well, providing 7 titlists. Mens: 1. Oregon State. 2. BYU. 3. CSU-Pueblo. CSU-Pueblo wins its 2nd ever overall title. Oregon State has been the dominant overall team leader here, having won 11 of the 16 overall team titles awarded since 2004. Oregon State wins its 3rd ever Men’s Title. They have a long way to go to catch CSU-Pueblo & Memphis here, as those two schools combined have won 31 of the 47 ever Men’s team awards given out. CSU-Pueblo wins its 1st ever Women’s title. Memphis, BYU and Oregon State have dominated here historically, winning 31 of the 45 ever women’s team titles given out. A side note: I know this tourney runs similarly to a tennis tournament, where schools provide teams seeded 1-6 … but the state of collegiate racquetball right now is such that the top rball colleges (specifically, CSU-Pueblo) are contributing such more dominant talent than other schools that I wonder if there wouldn’t be value in changing the format so that more players from the top schools could compete in the #1 division. To wit, the #2 female player from CSU-Pueblo was current LPRT #10 ranked player Adriana Riveros and their #3 female player was Brenda Laime Jalil, currently ranked 16th on tour. Both obliterated their respective draws, barely being scored upon (Riveros won the #2 draw giving up a total of 9 points in four matches, and Laime won the #3 final 0,0). It was the same to a lesser extent on the Men’s side, with Lukas Le representing CSU-Pueblo in the Men’s #2 and likely being the 2nd or 3rd best men’s player in Tempe. Perhaps he was the sole example of a player who may very well have made the semis or higher in the Men’s #1, but my point remains. International competitions feature two players from each country; maybe intercollegiates should as well. Moscoso the big winner this past weekend. Now that we’re all recovered from the weekend, lets take a quick look at Luis Conrrado Moscoso Serrudo‘s big win at the Open Bolivia American Irisgrand slam event. o Moscoso got out to a 6-0 lead. o Carson scored 15 unanswered to win 15-6 in game 1.
o Carson got out to a 10-3 lead in game 2, at which point it looks like Carson is going to cruise to an easy 2-game win. o then Moscoso cruised to the 11-2 tiebreaker win. o Moscoso was 6-0 in points to start the game, then Rocky took a TO. I found this to be a pretty amazing set of streaks. As an outside observer, I thought Rocky tired in the tie-breaker while Moscoso got energized. There were several balls left up that I just don’t think he had the energy to get to and he didn’t adjust to the lob-Z that Moscoso settled on to run off point after point. Age, altitude, and court time (it was Rocky’s 8th match on the weekend) all perhaps contributing factors … as well as the letdown of Rocky being in complete control of the match and letting Moscoso take Game 2. But hand it to Conrrado, who found another gear, just as he did in the 11-0 tiebreaker win over Landa in the quarters. – Moscoso becomes the 40th ever IRT pro tournament champ. He joins Charlie Pratt, Alex Landa , Sebastian Franco, and Andree Parrilla as first time IRT tour winners in the last two seasons. He also joins an interesting group of one-tournament winners in the IRT’s history, which includes Ben Croft, Rich Wagner , Mike Guidry, Tim Sweeney, and outdoor legend Brian Hawkes. – He becomes the first Bolivian to make a final, let alone win a tournament. He’s the second South American to win a tournament (Sebastian Franco was the first), and just the third South American to make a final ( Mario Mercado and Franco being the first two). Its only the fourth time in IRT history that a Bolivian has even made the quarters; The first ever was MoMo Zelada making the Quarters of the Nov 2015 Atlanta, then Zelada made another quarter a few months later, and Moscoso of course made the 2017 quarters where he lost to Kane. 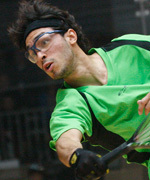 – Moscoso represents just the 5th ever country to have won an IRT event: USA, Canada, Mexico, Colombia and now Bolivia. – Moscoso beat the #1, #2 and #3 seeds en route to winning the event. That’s kind of hard to do. The only real way to do this is to enter a tournament as a specific seed that feeds into either the #2 or #3 seed early and then beat the #1 seed in the final. Moscoso entered as #23, which played into the #10, #7, #2 seed quarter. Jack Huczek also accomplished this when he won his first event as the #10 seed in Jan 2002 in Boston. And Kane Waselenchuk , when he won as the #39 seed, also ended up taking the same seed “line” as Conrrado did, beating #26, #23 and #10 to qualify, then #7, #2, #3, and #1 to take the title. – Moscoso, as the #23 seed, becomes the 2nd highest seed on record to win an event. He trails Kane Waselenchuk , who won his first tournament back after his 2-year hiatus in Sept 2008 as the #39 seed. These two are also the two highest seeds to even make a final, and #23 is the 3rd highest ever known seed to make a semi (Rodrigo Montoya made a semi as a #29 seed in one of his first ever pro evets). o Kane, Cliff Swain and Sudsy Monchik all won their 7th ever pro appearance. o Marty Hogan won his 8th appearance. o Jack won his 13th ever appearance. You can run this analysis by selecting any player then running the “Player Firsts..” report. It will give their tour debut, first win and the number of tournaments inbetween (along with ages at each event). Anyway, hope you enjoyed some stat-based facts about Moscoso’s big win! Hope to see him more on tour in the future. Maria Vargas the double winner on the weekend. LPRT Open Bolivia American Iris Grand Slam Wrap-up for the Ladies Pros. In the opening round/Round of 32s, no real surprises. There were 7 matches, and there were 6 three-game wins by higher seeded players. The sole upset was #18 Romina Rivero over #15 Daniela Molina, which earns her a shot at the 2nd seeded player. In the 16s … a few upsets. – #1 Samantha Salas dropped the first game to Bolivian youngster Micaela Meneses before advancing in four. – #9 Bolivian Yazmine Sabja Aliss put together a solid match, downing #8 Colombian Amaya Cris in three games. – #12 Bolivian Angelica Barrios shocked #5 seeded Nancy Enriquez in three straight 5,6,3. Barrios was the 2017 16U champ and is playing in her age 18 season, and this win avenges a loss Barrios had to Enriquez at the 2018 US Open. – #4 Rhonda Rajsich took out home-town Bolivian veteran Jenny Daza Naviain three straight to move on. – #3 Maria Jose Vargas was stretched to the brink before downing Bolivian 16U world champ Valeria Centellas 11-9 in the 5th. – #6 Natalia Mendez took out Bolivian native Brenda Laime Jalil in three straight forward games. – #10 Masiel Rivera Oporto, Bolivan native now living outside the DC area, avenged a loss earlier this pro season and took out #7 Adriana Riveros in a barn burner 11-9 in the 5th. – #2 Alexandra Herrera downed Bolivian junior Romina Rivero in three. Before moving on, i wanted to point out the nature of the Bolivian players who advanced into the 16s. Meneses is the 2x defending 14U world champ, playing in her age 15 season. Barrios was the world junior 16U title in 2017 and thus is in her age 18 season. Centellas is the reigning 16U champ and also has one more year in 18s. Rivero was the 14U champ in 2015 and 2016 and thus is in her age 17 season this year. All told including Sabja (world 18U winner in 2009) there’s 5 different former Bolivian junior national champs in this draw. The future is coming for women’s pros, and its coming from Bolivia. – #1 Salas was taken to the brink against Bolivian #1 Sabja, advancing by the quite-close scores of 10,10,11. There really was not that much between these two players on the day. – #12 Barrios took out her second top seed in as many rounds, defeating Rajsich in four. – #3 Vargas took out her doubles partner #6 Mendez 6,5,4 in the first ever competitive singles meeting between the Argentinian #1 and #2 players. – #2 Herrera dropped the first against Bolivian Rivera, but then took over the match and dominated the rest of the way, advancing in four games (2),6,2,2. – #1 Salas split games with #12 Bolivian junior Barrios before taking over and cruising to the final in four games. – #3 Vargas looked to be cruising to an easy win, but then dropped games 3 and 4 and barely held on with an 11-9 5th game win over #2 Herrera. In the Finals, Vargas over came a 2 games to 1 deficit and outlasted Salas with a great comeback, winning 11-9 in the fifth. Vargas wins her 4th pro title of her career and also gives her just her 2nd pro win over Salas in 7 meetings. On the doubles side, the Argentian #1 team of Vargas & Mendez (both of whom are naturalized Bolivians) outlasted the #1 seed of Salas & Rajsich (playing together for the first time) in the final to take the win and give Vargas the double on the weekend. Moscoso the double winner on the weekend. The altitude really played into these matches; normal kill shots were way up, rallies extended, lots of ceiling balls off the back wall. And, the size of the venue and the size of the crowds made it really seem like a major international event, especially when home town players were playing. – Carlos Keller Vargas pounded 18U Junior team member Gerson Miranda 9,0, showing the gulf between Bolivia’s adult and junior champs. – Similarly pre-tournament favorite Luis Conrrado Moscoso Serrudo blasted 18U junior team member Fernando Ruiz Michel 6,2. – Several local Bolivian players took out seeded/traveling players: Sebastian Oata surprised #22 Christian Wer 6,14, Franco Gutierrez beat #21 Edwin Galicia 11,5, Jairo Perez took out #20 Hanzel Martinez Perez and Fabian Gutierrez beat #14 Set Cubillos. – #16 Kadim Carrasco topped #17 MoMo Zelada in two, the only real surprise to me of this round. Carrasco really took it to Zelada, who has been playing solid ball lately, winning 1,9 to advance to the main draw. – #24 Carlos Keller Vargas took out #9 touring pro Thomas Carter 11-7. I thought Keller (a former PARC champ) would win here, but kudos to Carter for stretching him to the breaker. – #23 Moscoso blasted #10 Felipe Camacho 3,4 to make the main draw. Again, an expected result based on both players’ past international results, but surprised by the lop-sidedness of the win. – #15 Diego Garcia Quispe beat Guatemalan veteran #18 Juan Salvatierra 10,10 to advance to the main draw, an excellent result for the 17yr old. – #1 Rocky Carson took it to Carrasco and won 2,4. Carson took advantage of the high altitude and really ramped up his drive-serve game. – #8 Jake Bredenbeck couldn’t convert on game point in the first game, opening a path for home town favorite Keller Vargas to advance 14,6. A loud, partisan crowd cheered Keller to victory. – #5 Mario Mercado took care of business against #12 Robert Collins 10,11. – #4 Andree Parrilla saved game point in the first game and then battled to a close two-game win over Eduardo Lalo Portillo 14,9. A back and forth match went Andree’s way on this day, but Portillo continues to improve and show that he will soon be among the elite on tour. – #3 Alvaro Beltran outlasted upset-minded Eduardo Garay Rodriguez 10 and 13. Garay dove all over the court and came at Beltran with significant pace, but Alvi made shots when he had to and put balls away when it counted. – The biggest upset of the tournament: #11 Gerardo Franco Gonzalez took out #6 Rodrigo Montoya Solis 11-10. Montoya reportedly arrived at the tournament just the morning of this match and it may have cost him against a player he should have beaten. Franco earned this win though, saving off match point against and diving all over the court. – #23 Moscoso blitzed by #7 seed David Horn to setup a fantastic quarter final against Landa. – #2 Alex Landa let the youngster Garcia get way up in game one, came back, then blew him away in game 2 to advance 13,2. – #1 Carson left no doubt as to who the #1 seed was, advancing past home-town favorite Keller 8,11. Before the tournament I thought perhaps Carson would be at a disadvantage in this event thanks to his match load last weekend and the travel, but his fitness and his game has elevated here this weekend. – #5 Mercado, Bolivian native who now lives in the DC area and represents Colombia, really controlled #4 seed Parrilla throughout and advanced 7,11. I thought Parrilla was a dark-horse to make the final before this tournament, and was really surprised by how solid Mercado played here. – #3 Beltran left little doubt about his quality, downing upset-minded #11 Franco 11,5 to move on and ensure that the two oldest players in the draw made the semis. – In the most anticipated match of the event, #2 seed Landa was beaten by Bolivian #1 Moscoso in a scintillating match 9,(11),0. Moscoso drove the action with blistering drive serves, fantastic kill shots from all over the court and with knee-sliding re-kills that perpetually caught Landa off-guard. After losing steam in the middle of the second game, Conrrado caught fire in the tie-breaker and ran away to the 11-0 defeat. Its not often a former #1 player in the world gets donuted, and indeed this match elevates Moscoso to near the top of the world game. – #1 Carson fought back the upset-minded #5 Mercado, advancing in a tie-breaker win. – #23 Moscoso dominated #3 Beltran 10,6. In the final, Rocky ran of 15 unanswered points to cruise to a game one win and was well on his way towards and embarrassing 2-game crushing when suddenly Conrrado made it a game, saved a couple of match points, and got a fluky rally win to take game 2 15-14 and get it to the tiebreaker. There, Rocky had no answers for Moscoso’s confident shot-making and the game got away from Carson quickly … Conrrado re-killed shots from absurd angles and frustrated Carson over and again and took the breaker 11-2 in dominant fashion. Moscoso found a serve that Carson struggled with, and Rocky couldn’t adjust in time to stay in the game. Moscoso becomes the 40th ever IRT pro tour champ and earned it on the weekend, downing the #1, #2 and #3 seeds en route to victory. The Bolivian #1 pair of Moscoso & Roland Keller took the doubles title against Carson & Camacho 9,9, giving Moscoso the double on the weekend. Wrap: An amazing tournament that saw the surprise winner and the expected “what if” questions about the absence of Kane Waselenchuk. Rocky should ascend to #1 with the finals appearance, while Conrrado’s points total should put him just outside the top 10 (not that it matters; we likely won’t see him again until the US Open). Post publishing update: I guess the 2018 points expired earlier than I thought; Rocky remains at #2 while Moscoso rises to #17 based on irt-tour.com points standings updated as of 4/1/19. I think I now agree with Sudsy Monchik, who has been extolling Conrrado’s skills for a while. I think you have to start thinking about Moscoso as being at the top of the tier of players just past Kane and Rocky, and we can only hope as fans of the sport that he finds more ways to play the tour and give us what we want; regular match ups against Kane, Rocky, Landa, DLR, Montoya and the rest of the world’s best.